407 SW 3rd Street located in Downtown Bentonville. 407 SW 3rd St. offers LUXURY LIVING in Downtown Bentonville. GORGEOUS NEW HOME BY DAVE MARRS - Character/Quality & LOCATION! 4 bedrooms, 3.5 baths with 3275+ ht.sq.ft. featuring high end quality and unique touches throughout. Reclaimed Brick from a building in Milwaukee - Twin Rivers, WI in the early 1920's, The treads for the stairs are from a barn off the Mississippi from the turn of the century, the door leading to the master closet is believed to come from a library in East St. Louis in the early 1900's... That - along with high end fixtures with LED lighting, awesome patio with an island featuring a GREEN EGG, 32" Lion Premier Grill and a drainable ice chest... Custom Cabinets by Morgan Millworks, Iron by downtown Bentonville Ornamental Iron, Landscaping by Bradford Nursury - JennAire built in coffee maker, home is wired for surround sound with speakers installed - Pre-Wired for Security. GORGEOUS! GREAT LOCATION! for more info or to schedule your private showing of this #downtownbentonville HOME! For more photos of this home for sale in Downtown Bentonville - visit OUR FACEBOOK PAGE for Real Estate in Northwest Arkansas. CLICK HERE for the 407 SW 3rd St. album. 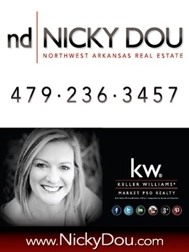 If you would like to TOUR the home - click below and you can use our REALTour of this amazing #DowntownBentonville Home for sale! Some good links about Downtown Bentonville - HOME OF WAL-MART and Crystal Bridges Art Museum!